V8 Powered Snowblower Can Probably Plow Through Cars Too | OhGizmo! While most of us would just leave a discarded V8 engine sitting on our front lawn until the grass grew high enough to hide it from the neighbors, Kai Grundt decided to use his to build the mother of all walk-behind snowblowers. Now you have to understand that not only is Kai a metal fabricator by trade, but he also lives in a small town called Muskoka (north of Toronto) where the winters can be particularly harsh. So having a V8 powered snowblower actually seems practical, instead of just insane. 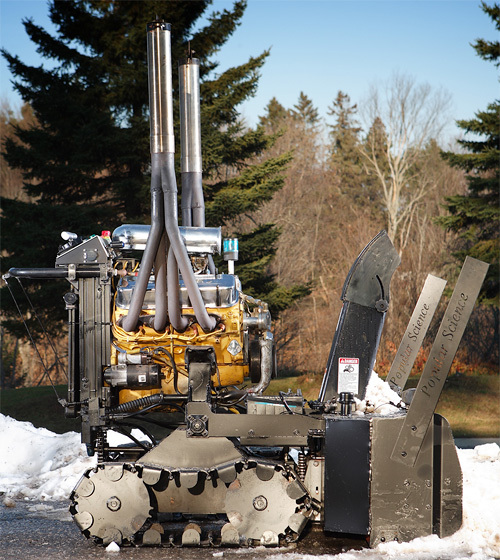 Once it was built, Kai’s snowblower tipped the scales at over 800 pounds, so he opted to switch from rubber tires (which couldn’t bear the weight) to custom made tracks that are powered by a couple of hydraulic motors fed by a pump powered by the V8 itself. The massive auger on the front of the blower spins about twice as fast as those found on a conventional (translation: boring) snowblower, which not only allows Kai to clear more snow, but throw it farther too. How far? Try 100 feet easily, which is far enough to bury his neighbor’s truck under snow from two houses away. Almost makes me wish I had a driveway, or at the least, be thankful that Kai isn’t my neighbor. Do I have Wall-E on the brain, or does that profile shot look like Wall-E with some pimped out exhaust?? We could have used this guy and his snow blower here in Spokane, WA a couple of weeks ago. Since the 18th of last month we have had 7 feet of snow. speaking of plowing through cars..
Hotels near best snow blower Sapporo Korakuen Hotel offers four star accommodation suitable for all parks Sapporo and scenic areas, and has an ideal location for business travelers.